CRAWFORDSVILLE, Ind. – The No. 7 Mount Union wrestling team currently sits in third place out of 19 teams after the first day of competition at the NCAA Division III Central Regional at Wabash College. With 80 points, the Purple Raiders are 14 points behind first place No. 5 Baldwin Wallace (94) and 11.5 points behind second place host No. 4 Wabash (91.5). No. 15 Olivet (Mich.) is fourth with 70 points to trail Mount Union by 10. Six Mount Union wrestlers are still standing in their championship brackets in No. 1 Jordin James (Bedford) at 133 pounds, David Massey (Cuyahoga Falls/Woodridge) at 141, No. 10 Luke Hernandez (Nashport/Tri-Valley) at 149, No. 6 Antwon Pugh (Fairlawn/Copley) at 157, Michael McIntire (Wadsworth/St. Vincent-St. Mary) at 165 and No. 2 Jairod James (Bedford) at 174. Sophomore Nolan Wochna (Brecksville/Brecksville-Broadview Heights) and freshman Landon Talbert (Salem/Crestview) continue competion in the consolation rounds at 125 and 197 pounds, respectively. 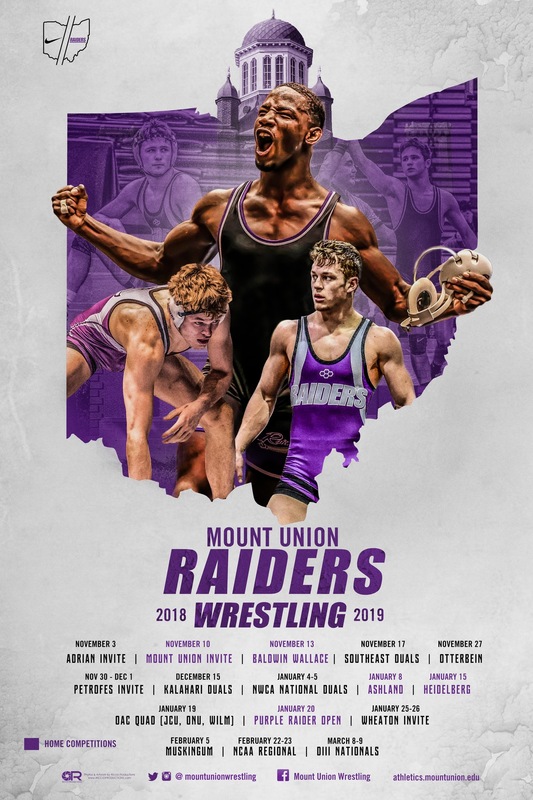 Each Mount Union wrestler is set to place in the top eight within their weight classes. The top three finishers per weight class will advance to the NCAA Division III Championships taking place March 8-9 at the Berglund Center in Roanoke, Va.
Wrestling at the regional tournament will resume Saturday with matches starting at 10 a.m.